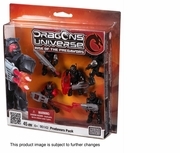 Product Detail Summary: Enter a Universe where man and beast now join forces to rule over the fate of the universe! To win the war against the meddling Alliance, build your Predavor forces and crush your enemies with the Predavor Fig Pack! Join the vengeful General Varro Sejanus, the scheming Sergeant Caprenius, the deranged Sergeant Lunaris and Privates Rubico and Barbatus as they fight the Alliance in your exciting missions to rule the universe! Are you prepared for the Rise of the Predavors? Ideal for children ages 6 and up!